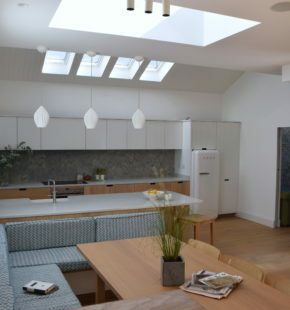 It is often the way that the client has a strong sense of how they visualise their new kitchen well before their first visit to the Design Studio, these clients were no exception and had put a lot of thought into layout ideas of how this kitchen was going to work for them and exactly what they were looking to achieve in their updated space. 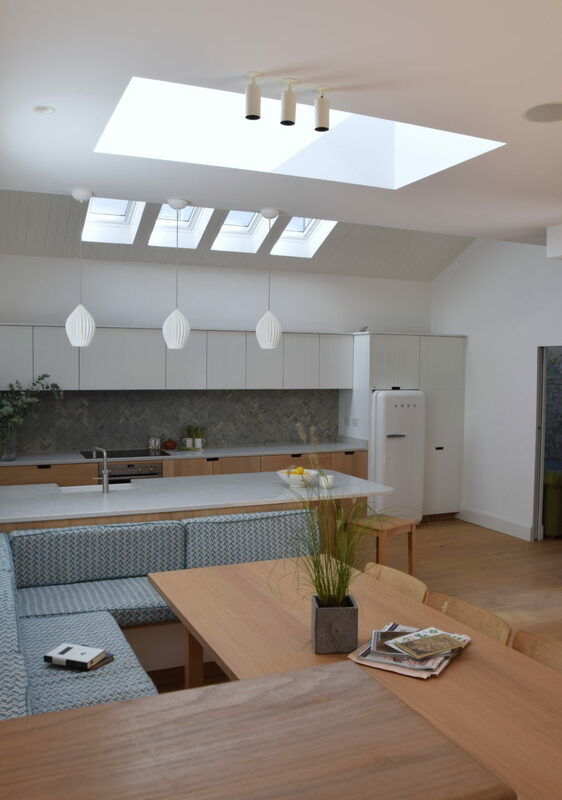 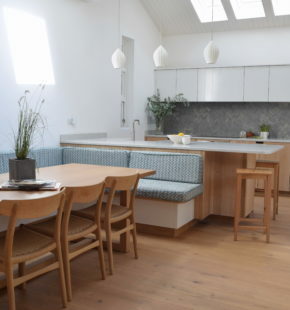 Nick worked with the client to come up with a one off design that would give them a fresh and clean looking kitchen ideal for their young family spending time on weekend and holiday breaks in their refurbished holiday home. 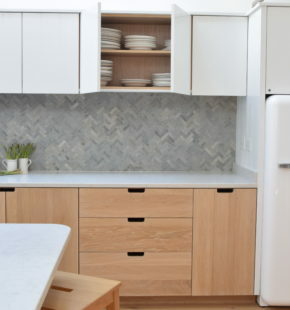 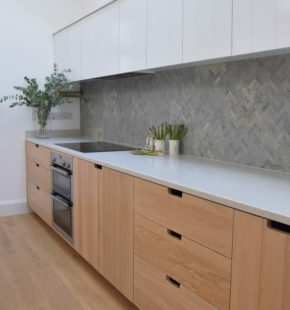 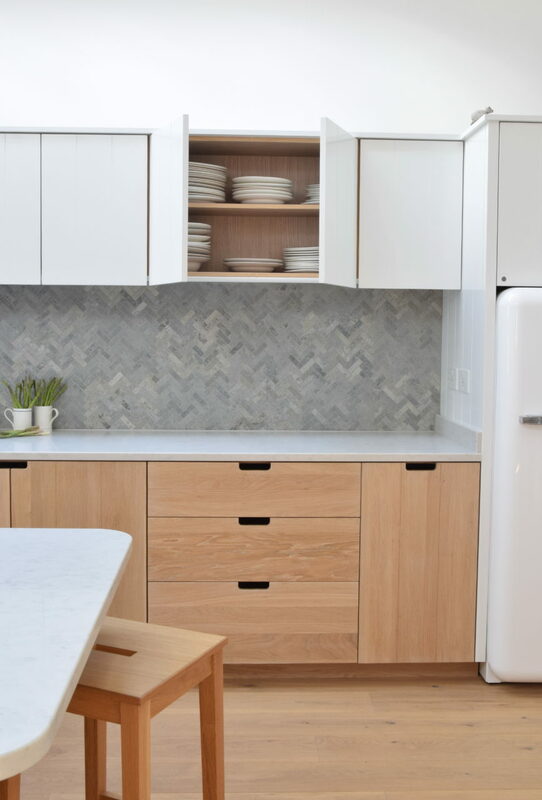 The whole look was to have beach appeal with the base cabinets in oak with a white oiled finish and a planked effect on the doors, while the wall cabinets were designed to be lacquered and handless and could be opened purely by pulling a lip along the bottom edge. 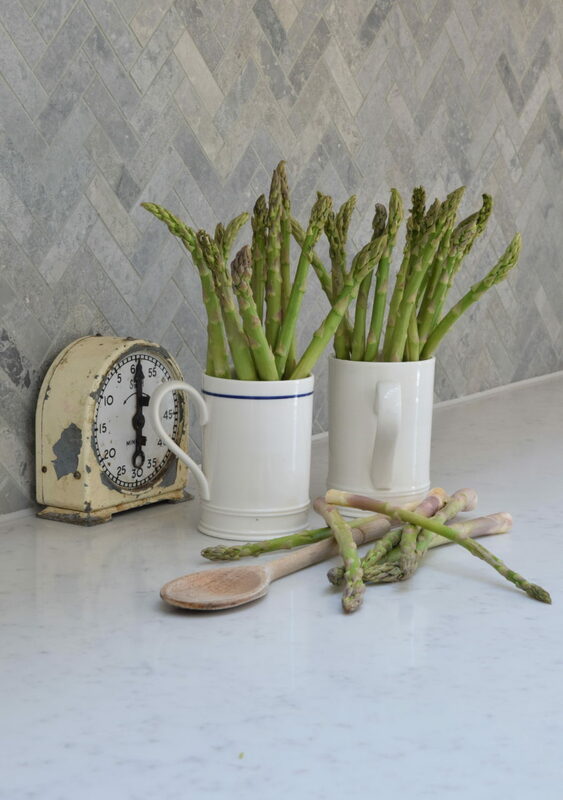 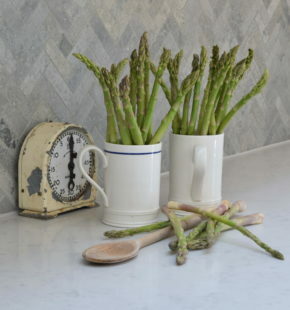 The worktops in Teltos Carrara Onyx is a composite quartz work surface and can handle hot trays, children baking, lemon juice and drink spillages- ideal when you want to be relaxing and not worrying about constantly cleaning up after everybody. 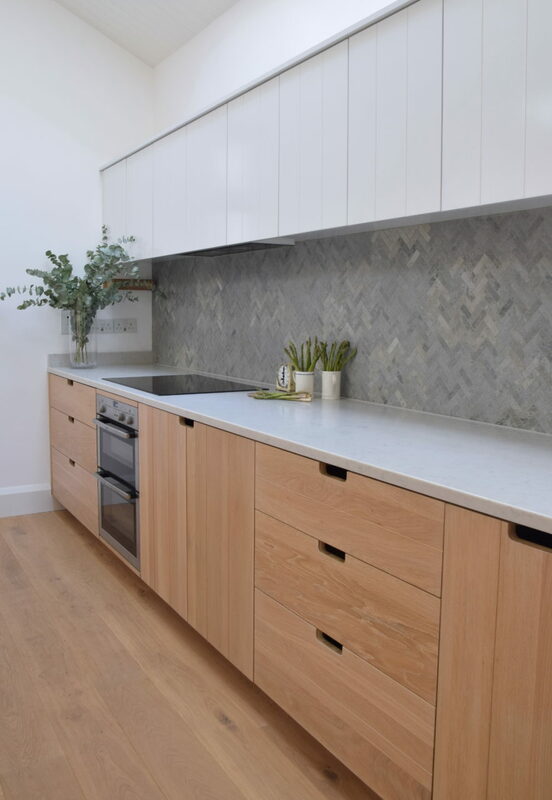 The quartz keeps the look clean along with the Fired Earth herringbone tiles which provide a contemporary splashback on the back wall run. 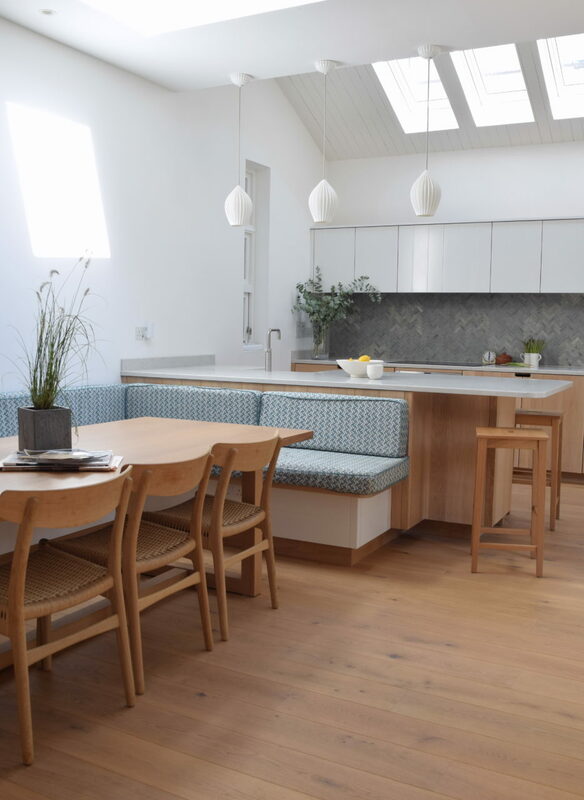 A large banquet seating area was designed and built in oak and lacquered in order to be part of the kitchen and had more of a holiday feel than just a straight table with chairs, it can also seat far bigger numbers of people than conventional seating.